Collaboration, flexibility and teamwork are key buzzwords in the workplace. The meeting room and meeting space has become a key tool in creating a base to work from, adding multiple functions for heightened workplace efficiency. We have taken five different types of meeting spaces and picked five different styles of tables to match and present inspiration for creating these looks. The meeting room can be as imaginative as any other room in the workplace. Create a bold and attractive space by adding a colourful table. The X round table is both daring and highly functional. 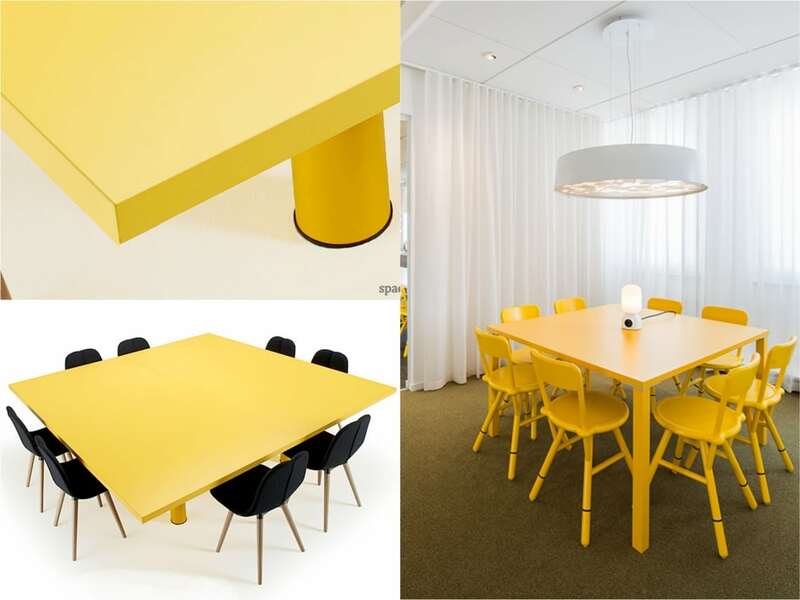 An engineered solid wood table top rests on two large circular powder coated base legs. With a single table, create either a long rectangular form or a square, seating up to 12 people. 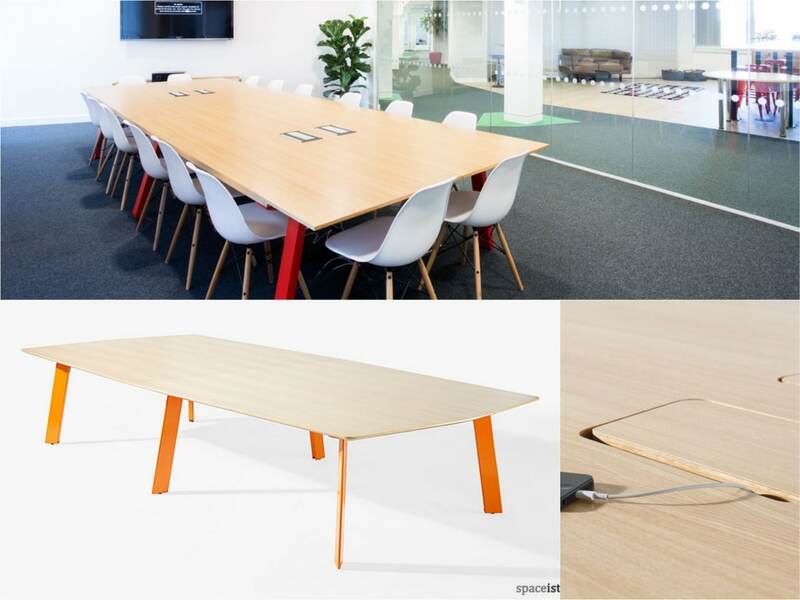 The vibrant yellow or red colour options add an attractive finish, whilst the option of cable hatches and plug points means the table can be made fully equipped for a meeting for a conference. A small meeting room is an ideal option suitable for various activities. As well as smaller group discussions and meetings, they are a great place to work away from the desk, adding privacy and extra workstation space when required. 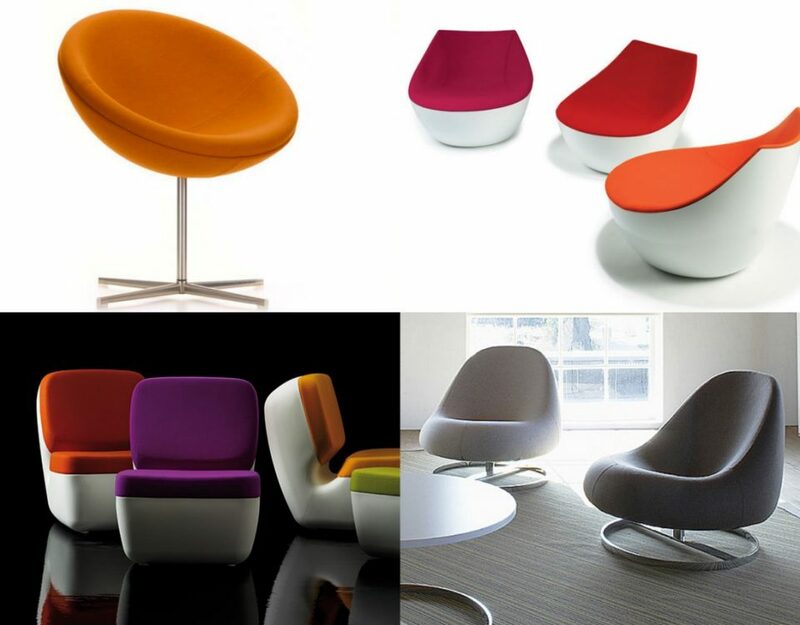 A classic yet modern option for a smaller meeting room is the X round table. We have chosen the X round meeting table as it provide a comfortable space for up to six people and provide a variety of modest features. 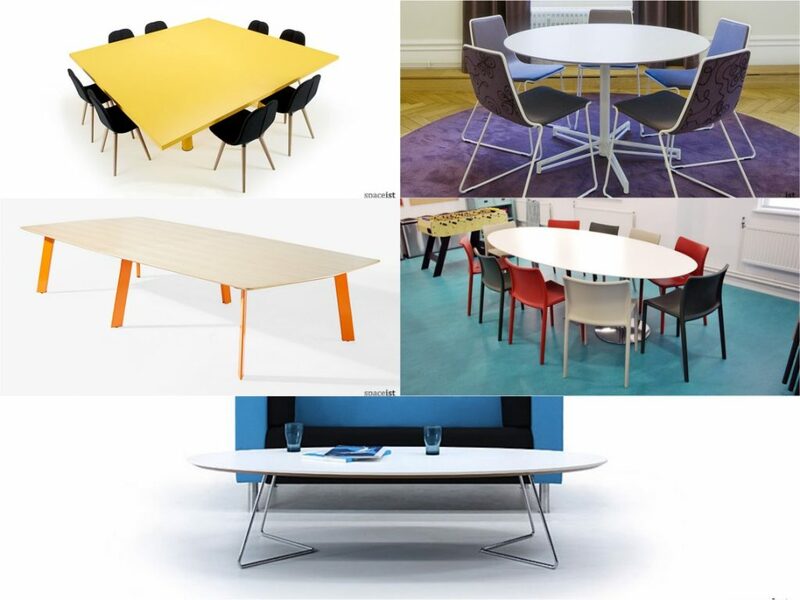 The durable laminate or wood veneer finish table top comes with a stylised star base frame. With a selection of colours available for both the top and base, the X round meeting table offers simple modernity for a small meeting room. High-tech conference rooms and larger meeting rooms demand support to allow them to function in the most crucial moments. For both internal meetings, these rooms become an important space when presenting to clients or potential customers, meaning they require a high standard of attention. To match this demand, we have chosen the Blade meeting table. Highly functioning with contemporary design features, the Blade is a highly suited option for large meeting rooms. Alongside a full cable management system, it comes with customisable solid laminate table top and base legs. Pick from laminate or wood veneer top and add a little colour for an updated look. Within an office space, a meeting area can be anywhere, as long as there is somewhere to sit and is surrounded by a table. 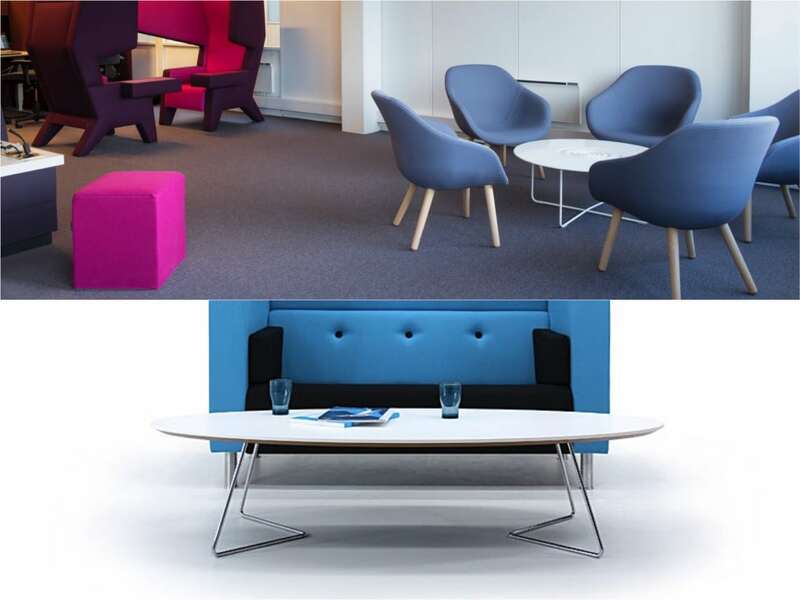 Creating informal meeting spaces within flexible workplaces allows multiple activities to take place, from socialising to collaborating. 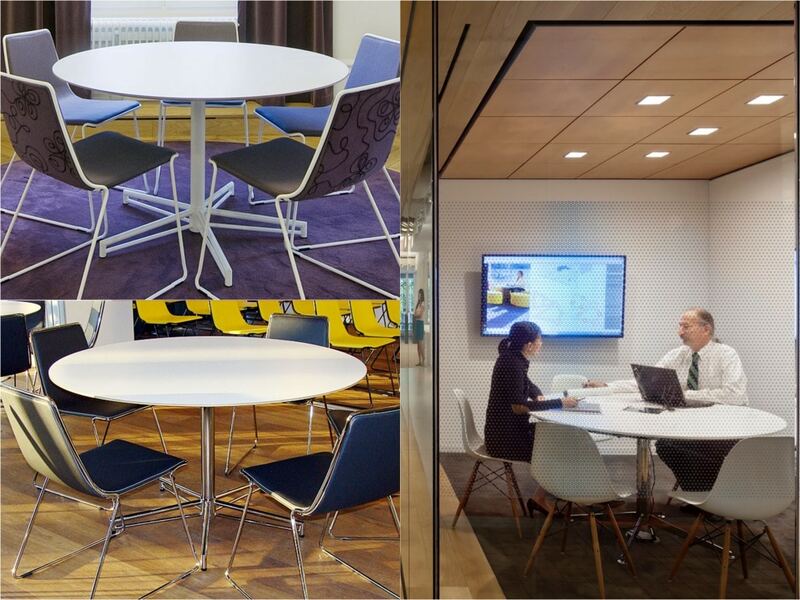 For those small yet highly adaptive spaces, we have chosen the Plus oval table. The simple yet stylish chrome base and bevelled edge table top add small refinements to this modest table. The Plus is a combination of contract grade laminate with a natural lacquered edge and wood veneer top options. Complement this low table option with stools and comfortable soft seating to create a relaxed and informal meeting space. A large communal space is usually the ideal space to taking breaks, getting away from the desk and large collaborative meetings and discussions that are less formal. Where spatial qualities of a workplace allow it, adding a larger meeting table to support these actives becomes a great focal point within the larger office space. 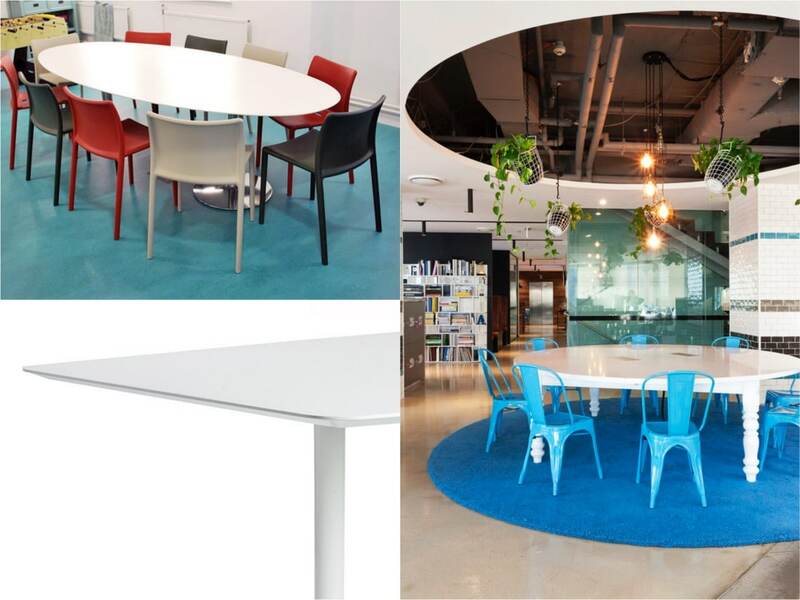 To create a communal space, we have selected the Disc oval meeting table. A composition of two disc base stand and a melamine table top, the oval shape allows this corners table to function for a variety of uses. The bevelled edge adds a contemporary look whilst the customisable base comes in over 60 RAL colours to give the table a vibrant look if desired.